Question 1: What to do if the tablet PC can’t start up? a. Check if the battery has no power. b. Re-check the tablet PC again after connect to the power adapter (need to check the adapter whether has no problem or not). c. Click the RESET key. d. If the tablet PC still cannot start up after battery charged, please push for 30 second the power key and later of 10 seconds turn on. Q2: What to do if there is no sound in the earphone? a. Please check the volume if set as “0”. b. Please check if the earphone’s connection has no problem. 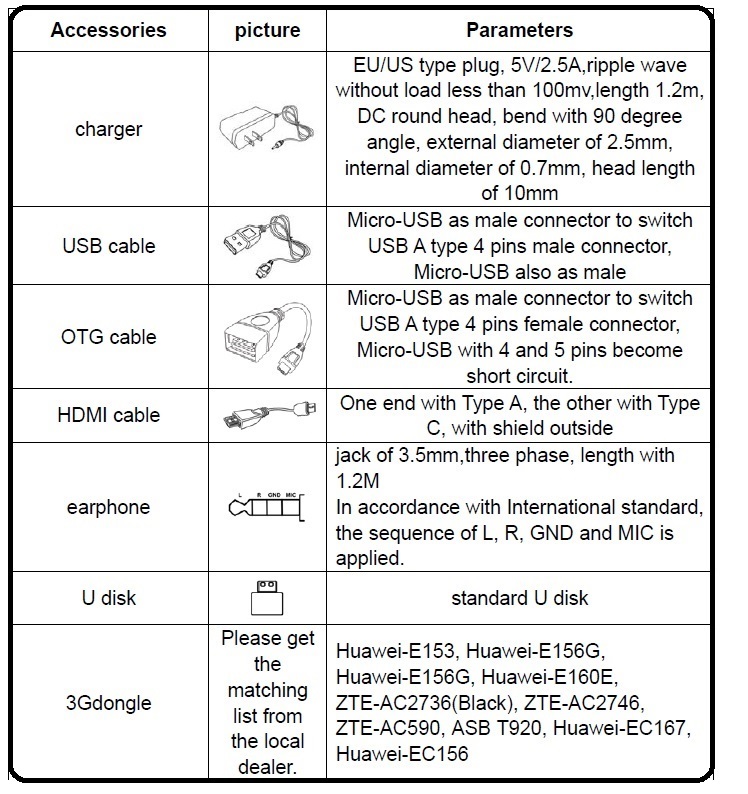 c. Please check if the earphone matches the type of the tablet PC and the earphone whether has no problem or not. Q3: What’s the matter when the earphone has serious noise? a. Please check the earphone’s plug if clean or not, the dirt may leads to noise. b. Please check the music file if damaged or not, and try to play other music to confirm again. If the file has damaged, it may leads to serious noise. c. Confirm the noise whether belongs to all audio files or individual file. Q4. What’s the matter when screen shows unreadable code? b. Please reset the tablet PC if screen shows unreadable code after start up. c. Please check whether the tablet PC is incompatible with installed APK if the unreadable code shows when system is running. Q5: Why Wi-Fi cannot be connected? Original tablet PC has Wi-Fi function which our QC department has tested all before delivery, the Wi-Fi can be connected to the network, but there are some friends can’t receive the Wi-Fi signal after take the tablet PC back home. b. Select for each mode for the wireless router transmitting modes. c. Adjust the SBC case and DBC case modes to check if the password you entered is correct or not. When you enter the password click in show password to confirm that your entered password numbers or letter are correctly entered. d. There is a green Wi-Fi logo with tick shows in the bottom right corner of screen when Wi-Fi is connected successfully, otherwise, not like that. e. Check if the router is normal or not, you can close the router for minutes and re-try if the tablet PC is connected to the network normally. Q6: Which software version needs to download between mobile phone version and computer version? A6: Neither, its Google Android version, the suffix of file format is APK. Buyer can access to Google Play to download massive apps. Q7: Can system firmware supports to upgrade? A7: Yes, you can contact us to get the new firmware to upgrade system if our provider released a new firmware. Q8: What’s the problem about the tablet PC is always crashed? 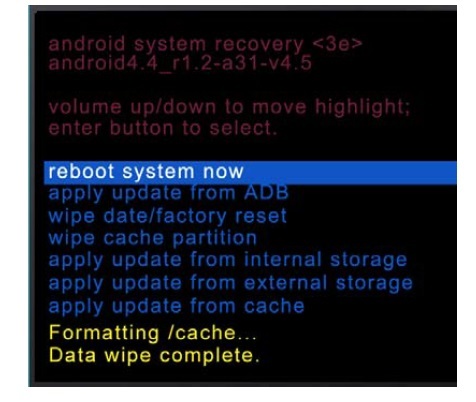 A8: The first startup of new tablet PC will automatically identify each hardware status, the unstable DDR running may cause tablet PC crashed, you can click "Factory Reset" to reboot system. 1. Running APK as battery charging. 2. Running tablet PC with low battery. 3. Too many application programs opened. 4. Incompatible APK running in the tablet PC. These four status may cause system crashed, it’s not the quality issue of the tablet PC. Q9: How can I do if I carelessly pressed the tablet PC and then the screen display is turns into white, but the TP is still can be touched? A9: Table PC’s screen is divide to three layers, the outside protective layer, the middle touch screen, and the inside LCD, it should be LCD broke by yourself. Q10: How can I do if tablet PC fell to the ground and the screen can be displayed normally, but there is a part of TP can’t be touched? 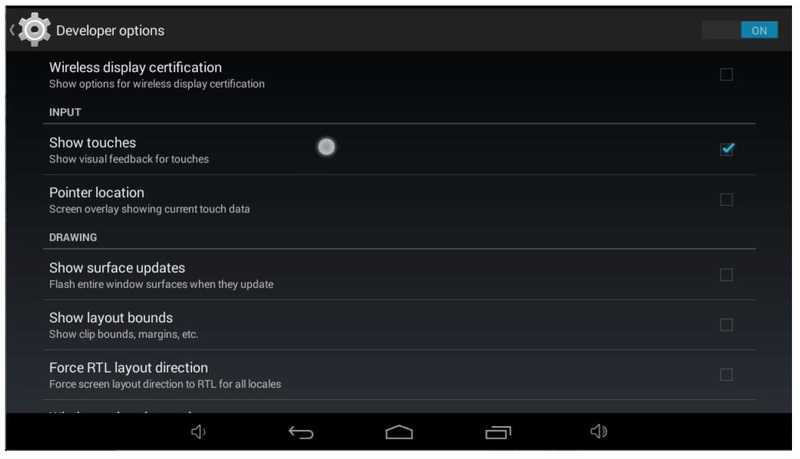 A10: Click Touch Detection Function in setting to see if the touch is discrete, if discrete, we can prove that the touch screen has broken and need to change a new one. Q11: I can faintly see the screen is broken with poor display, but which one is broken between outside screen and inside screen? A11: There are three layers in the tablet PC's screen, the outside layer is protective layer which can be interpreted as glassy layer (it's not made by colored glaze material), the middle layer is TP (Touch Panel) that is what people called Touch Screen, and the inside layer is LCD, it does not impact the function if the protective layer is broken, and a part of TP can't be touched if TP is broken, but you will see nothing if the LCD is broken. Q12: My tablet PC installed a desktop software which led to system error, it also showed force close after start up and cannot enter to system. I asked the professional who said that I need to reinstall the system, how can I reinstall a new system? He emphasized that my tablet PC has no response and can only reinstall the system by computer, so how can I do? To settle the problem in detail, the specialized software is necessary. a. Click RESET key to see if can start up. b. The way to start the tablet PC's reset function: One hand presses the volume+ or volume- (Please pressing with your finger and do not release it), and another hand repeatedly click the Power key for two times until the screen shows system recovering status. A12: If you have no confidence to reinstall a new system, please feel free to contact us to finish the reinstalling under our customer service's instruction and we will also provide you the upgrade software of the tablet PC on how to learn the course of reinstalling system by yourself. Please be careful to operate in case of tablet PC become a dead machine. Q13: Few days ago, I gave my tablet PC's battery charging and I didn't pull the plug out when battery is fully charged, but after a period of time, the screen is became a blank screen and the TP is no response as well, and then the tablet PC is forcedly power off by myself, finally the tablet PC can't be started up again. What's the problem about this? a. Click RESET key to see if the tablet PC can be normally started up. b. Starting the reset function of the tablet PC, please refer to Q12-b. c. Please return the tablet PC to our factory for testing if above ways can’t work. Q14: Why the tablet PC suddenly power off when there are still 10% or so battery power showing in the tablet PC? a. Make sure there are no more APK’s under running. Q15: What is the problem when tablet PC’s browser is loading webpage slowly and then the webpage can’t be accessed? a. Check if the network connection is normal or not. b. Check if the APK of browser is damaged or not. How to solve the issue when battery display doesn’t show correctly? If battery display stays for a long time at 100% state, or the device shut down when around 20% state, it's because that the specialty of each battery is different, caused the calibration of the battery goes wrong, under this case,you can long press the power button for 20s to solve this issue. We usually suggest end-user to long press the power button for 20s when turn on the device for the first time, then fully charged the device to 100%, then discharge the power till the device shut down automatically. It's our strong suggestion that it's quite necessary to have a complete charge and discharge of battery when turn on the device for the first time, so that the system can have a calibration of the battery. Firstly please enter Settings interface to select APP, slide left to select ALL interface, select the software you want to remove, click uninstall and clear data point to completely uninstall this software. How to deal with the issues such as running slow and system error caused by the excessive or incomplete applications? 1- Try to uninstall applications which cause system errors. 3- If the above could not settle, please select in the settings directly to restore factory settings. 4- If the abnormal running of system is serious, it is recommended to clear user data together and make a complete system recovery. As incomplete applications will damage FLASH when running, especially frequent user data partition and the partition cache read and write easily causes damage,but generally saving the firmware partition will not be damaged. If FLASH is damaged, user data partition and cache partition must be formatted, as completely format could remark and bypass the FLASH bad block so that original system will be restored to ensure the system operating normally. How to do when the device could not enter the system at the booting state? 1- Make sure the device is turned off, try to press the power button more than 20s to ensure it’s turned off. 2- If you are not certain whether the device has enough power, please connect the charger to ensure uninterrupted power during operation, as the power failure during operation will cause irrevocable system loses. 4- In this interface, press the left side volume key to perform up operation and the right side volume key to perform the down operation, the power button to perform confirm OK, press twice on the right side volume key to select wipe data / factory reset, press the power button to confirm the operation and then go to the next interface. 5- Select yes, and then return to the previous interface. 6- Select “wipe cache partition”, confirm to perform this operation, and then return to the previous interface. 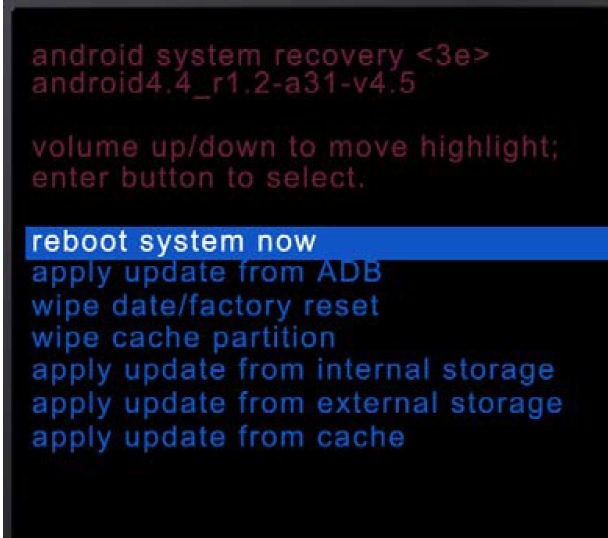 7- Select “reboot system now", to enter the system again, then it will become normal. How to settle the case of the stopped system caused by the running of incomplete applications? Please press the power button over 20s until the machine screen turn black, then re-boot; or press the reset button to restart directly. How to do when the machine is in the black screen, but press the power button does not work? Firstly make sure if the device has power, please connect the power supply to check if there is the “low power warning” and charging animation. If there is no low power warning icon and charging animation, please check whether the device is really in the off state, long press the power button 40s over grim death to ensure that it’s into off state, and then try to boot; If you are uncertain whether the device is in a low power status or not, please charge for 10 minutes or more, and then try to force shutdown and boot, because some unstable or not compatible third-party software with the machine running will lead to DDR fly, which led to the display blank without any content, and make users take it as off state mistakenly. What to do if some webs cannot display correctly? If the network and the site itself is not a problem, you can try to change the browser settings, select settings as the following chart, enter the browser mode interface, switch to the other mode, and refresh the site to see whether it’s normal display. The website opened will first check your chosen browser mode and send the corresponding data according to your selected mode, if the ipad mode is selected, the page sends data to comply with ipad patterns, but if the website does not consist with data of ipad pattern, it will not display properly. As Android system based, it’s suggested to directly download the corresponding APK, rather than using a web. 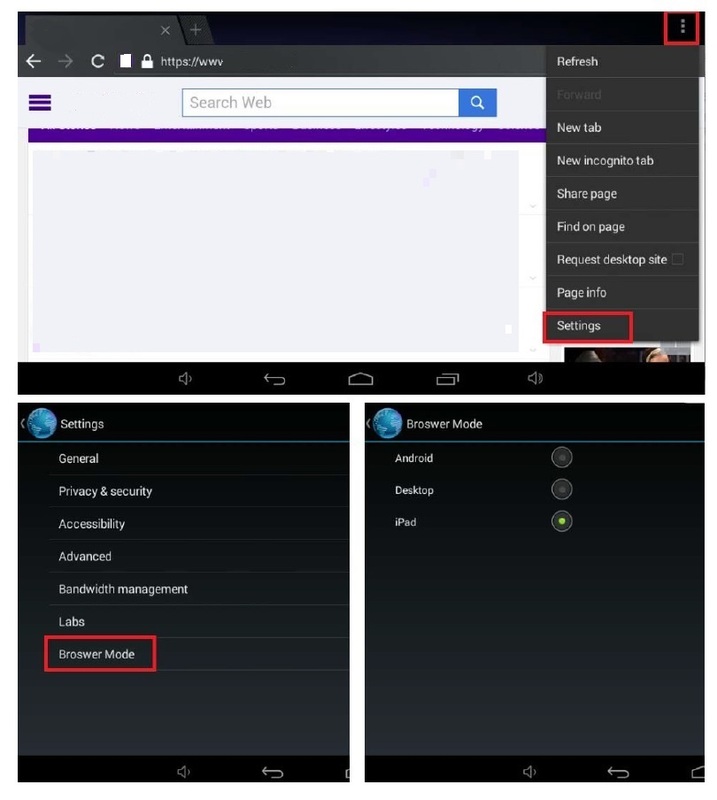 Lots of pages are not optimized for the Android system, so the operating interface is not suitable for use on tablets. Why is the FLASH capacity shown in settings less than the nominal capacity of the specification? Firstly, the capacity of the specifications refers to nominal capacity on the hardware for FLASH, with binary to calculate capacity, which is 1GB = 1024KB; the capacity shown in settings refers to the capacity of software computing, with metric calculation that is 1GB = 1000KB. Secondly, the Tablet PC FLASH is divided into multiple areas, such as: system partition, data partition, system reserved partition, U disk partition, of which system partition occupies about 1GB of space to store the system firmware, the more procedures packaged, the more space it will take; data partition to occupy about more than 2GB of space, which determines how many APK we can install; system reserved partition to occupy about 1GB of space, as a necessary fixed partition system functionality to run; the above three kinds partitions are hidden partition, the end user can not see and can not use, or delete; U disk partition is modeled as an external storage system partition, which can be seen and used by end users, and the user sees in the settings capacity, the system assigns them to the user's capacity as only part of the FLASH, so this capacity must be smaller than the nominal capacity of the specification book . How to check the hard disk space? 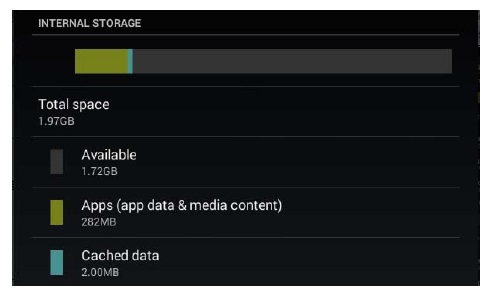 What does every option mean in the storage of settings? The following figure shows a screenshot of part of the total hard disk space, space illustrates the composition, spatial capacity digital display, digital space capacity of the various components of the display, consisting of four parts of the hard disk formatting options. Other extended storage also shows according to the same rule. 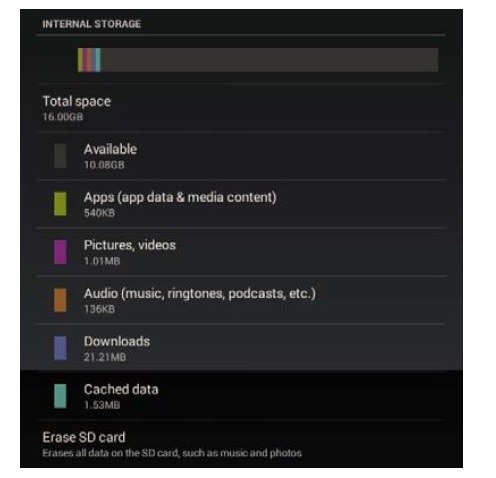 The following figure shows the screenshot section Data Partition (data partition) which is composed of the size and capacity, the remaining free space determines how many APK you can still install. The following figure shows a screenshot of built-in storage space capacity, capacity FLASH above 16GB consists of inner card and internal storage in two parts. The following figure shows a screenshot capacity with external TF card inserted. 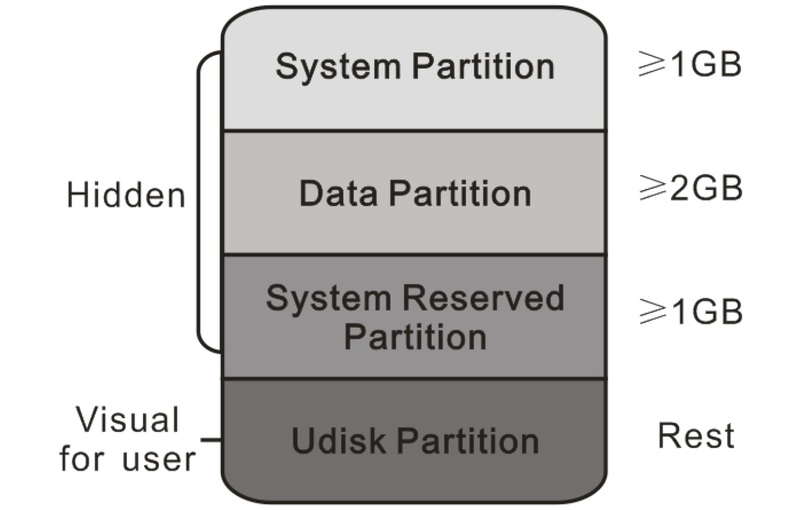 The following figure shows the external memory capacity with access to the USB HOST. The following figure shows the external memory capacity with access to the USB OTG. How to find the file in different storage media from the file manager? Please enter the filer device root directory, select mnt, enter the path which has stored all the storage medium, as shown below, sd card is hard 1, intsd hard disk 2, ext sd TF card, usbhost0 USB OTG interface is introduced storage media, usbhost1 storage media USB HOST interface is introduced. Click on the appropriate folder, you can browse the files in the appropriate storage media, including the models with less than 16GB, intsd is empty hard disk 2 does not exist. What is the viewing angle of the display screen? It refers to the angle when the user could watch all the contents on the screen clearly from different viewing directions. By providing light through refraction and reflection LCD display has been output after a certain direction when viewed in the outside this range will produce color distortion. The TN screen tablet generally has horizontal viewing angle of 178 °, vertical angle as 90 °. 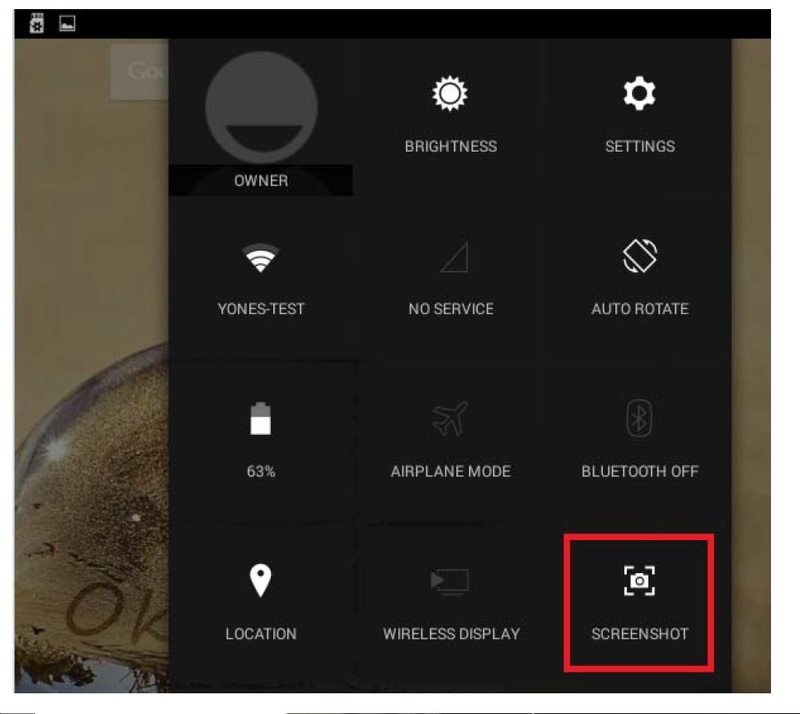 The device has two screenshot methods ,drop-down menu in the upper right corner there is a screenshot of the shortcut icon, or use the key combination [Power and volume+ key] while pressing these two key screen will automatically shots, screenshots will be saved in the photo / screen shoot folder. Why does the screen sometimes mistakenly response when connecting the charger and how to settle? How to confirm which is actually the point in response to my touch? The root reason for mistaken touch is that the electricity from charger involve in can interfere with touch screen point scanning frequency interference, and cause the user to touch the point A, but the reaction is the point B. The device matches the charger through scanning frequency matching, usually do not appear this problem, but if the user loads and locations of the grid more complex, when a charger can not filter out the interference point, there will be a touch screen mistakenly touch phenomenon. Why chargers could not be replaced at random? Please do not use non-matching charger. The use of non-matching charger may cause following hazards: voltage or current undesirable lead to failure of charging and even burning of the device, the ripple undesirable will lead to bounce point on touch screen which can not be used, particularly large ripples with long-term used will burn machine. Unsatisfied quality charger will even endanger the safety of persons. Please note a huge mistake using the charger lead irreparable hazards. If any series of accidents caused due to the replacement of charger, we will not take any responsibility for the device. How to do if chargers lost? Please re-purchase a matching charger, if emergent, the temporary used charger must meet the following requirements: formal branded quality charger with output voltage of 5V, current must be larger than 2A, the ripple preferably less than 100mV, the ripple frequency best meet the scanning frequency of the touch screen. Current and voltage requirements relate to the product safety and the safety of the necessary conditions, frequency requirement is to avoid charging the touch screen with bounce points, which is non-essential. You can not use the charger less than 2A, please refer to 'battery charger and charger power distribution Details' for the reasons. Battery charging time for the device is subject to the battery charge current, the current value of the battery charged is not equal to the nominal current value of the charger, the value and change the charging current is set by the system software, nothing to do with the hardware. And in different states, the device charging current is different on battery. When the device is turned off or in sleep state, the system software set the battery charging current as 1.5A, from 0 to 100% full charge it takes about four hours; when the device is boot normally, which refers to normal use while charging, the system software set the charging current to the battery as 4 50mAh, from 0 to 100% full charge it takes approximately 13 hours. less than this current charger (eg 1A) to charge, the high current of the charger will force output voltage pulled low, the charger will be in abnormal operating conditions, together with the damage to the device. In summary, the nominal current of the charger selected can be larger than 2A, but not less than 2A. Is it feasible to charge with the USB port of the device? The device's USB OTG interface can accept an external power supply, when accepting power from the USB port charger, regardless of the boot, sleep or shutdown, the system software set the charging current as 800mA. Under shutdown and sleep, it will take approximately 8 hours from 0 to 100% full charge; in normal working condition, because the system working requires 0.7 ~ 1.2A current, it’s often not enough for the system with the USB charger supplying 800mA, there is no redundant power supply to charge the battery. The battery power in turn have to release the power supply of charger together for normal system use, so in normal working state, the majority of the battery will not be charged but in a discharged state, as the charger provides 800mA power supply, the discharge time is significantly extended. When USB OTG interface of the unit accepts power from a computer connected via USB cable, regardless of the boot, sleep or shutdown, the system software set the charging current as 500mA. Under Shutdown and sleep, it will take approximately 12 hours from 0 to 100% full charge; in normal boot case, it is the same with USB charger. Special note: if you have to choose USB charger, please note that the USB charger could not have the case of short-circuit for 5 pin foot, if yes, the device will not recognize, and it can not be charged. Will it affect battery life if you keep charging the device with adaptors? There is a misunderstanding point: please refer to the 'The charging time of battery and the charger’s power distribution details', when the battery is fully charged (100% power), even if still connected to the charger, the charger can no longer charge the battery. In this case the battery is not working, nor connected to the device, and there is no discharge, and nor consuming any battery life. How long is the working time? How to extend the working time after full charge? The working time is equivalent to the battery discharge time, which is determined by the consumed current under various states. The device normally requires 0.7 ~ 1.2A working current, which indicates battery discharge time is about 4.5 to 8 hours. If possible, to reduce the brightness of the display and voice down the sound can effectively extend battery life, especially for the display power consumption accounting the largest proportion; meanwhile please kindly close useless programs running in the Android background and features such as WiFi, Bluetooth, navigation, communications to save much power energy. In addition to the normal shooting and video features, there are high-speed continuous shooting and panorama photography capabilities. Below is a list of shooting functions for rear camera, you can switch the camera, select continuous mode, select a shooting mode, magic wand, set the camera. Rear camera take photo 1600x1200 pixels, GPS tags or patterned lines can be inserted, you can re-select the storage location; select panoramic photo, press the shutter button, gently move the camera horizontally, with the progress bar going to the end, panoramic photo shoot completed. 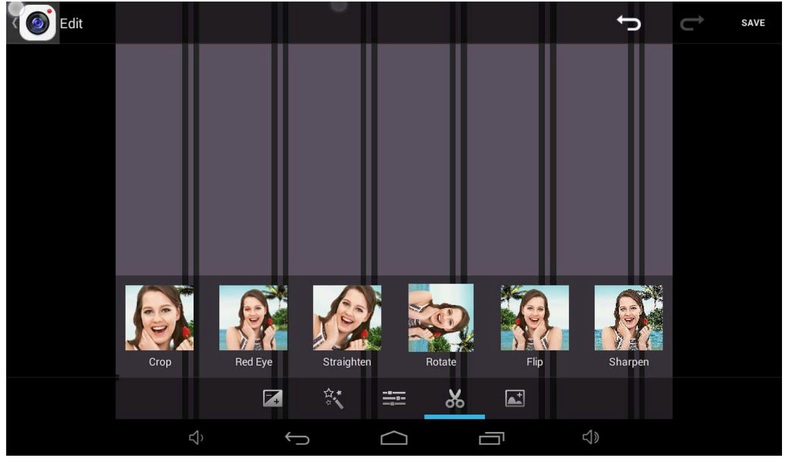 Select continuous shooting, pressing the shutter button can quick shoot photos, release the shutter then stop taking pictures, and enter the browser selection screen; select high-speed camera, clicking the shutter button to make the high-speed continuous 10 photos shooting in 1s, and enter Browser to select the interface. The following is the function list of the rear cam: white balance, time lapse and video quality could all be set.